Lattice enthalpy is a measure of the strength of the forces between the ions in an ionic solid. 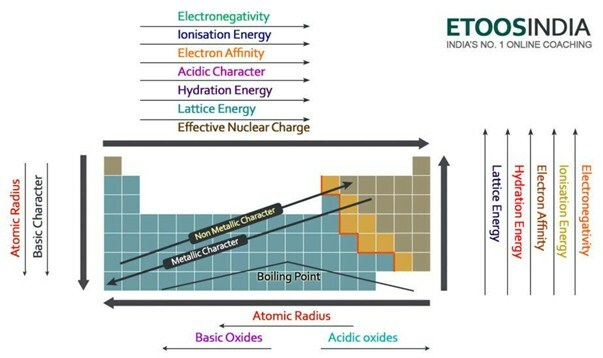 Lattice enthalpy increases with the charges and decreases with the size of the ions. First of all, what is lattice? In chemistry, when the term lattice is used, we usually refer to a crystal lattice which is a highly transparent substance with a regular geometric shape. The 3-dimensional arrangement of atoms or ions in a organised crystallin pattern within is referred as crystal lattice. For example, if we say 'sodium chloride crystal lattice', we mean a regular geometrical pattern of sodium and chloride ions. Lattice enthalpy is usually applicable to ionic compounds, which are compounds formed by metals and non-metals. Lattice enthalpy (H) values are usually represented in kilojoules (KJ). Lattice enthalpy and lattice energy are commonly used as if they mean exactly the same thing, although there is a difference between them which relates to the conditions under which they are calculated. Lattice energy is the energy required to separate 1 mol of an ionic solid into gaseous ions. If we take NaCl as example and we want to prepare sodium chloride crystal lattice, the lattice enthalpy of sodium chloride will be the energy necessary to form solid sodium chloride crystal from gaseous sodium and chloride ions. The formation of a solid crystal usually releases a huge amount of energy into the environment; hence, the process is exothermic, and therefore its value is always negative. Lattice enthalpy is a measure of the strength of the forces between the ions in an ionic solid. The greater the lattice enthalpy, the stronger the forces, and higher is the energy released in the environment when the crystal is formed. This energy is released when bonds are made and is needed to break bonds. This force ceases to exists only when the salt is at the gaseous state, therefore when the ions are scattered too far away to each other. Figure 1. 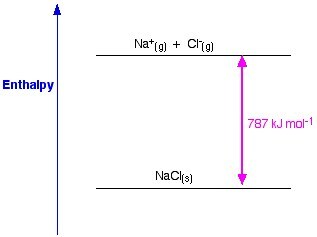 Lattice enthalpy of NaCl. Www.chemguide.co.uk. The main factors affecting the lattice enthalpy are the ions charge and the ions radii. Let's analyse them one by one. The greater is the charges of the ions, the greater is the attractions between them, and consequently the greater is the lattice enthalpy. For example, Sodium chloride NaCl and magnesium oxide MgO have exactly the same arrangements of ions, but the lattice enthalpies are very different. As Mg has 2 positive charges +2, they attract the negative charges O -2 more than the charge of Na + 1 attracting only one negative Cl – 1 . The smaller are the radius of the ions, the closer the charges are, the bigger is the attraction between them and consequently the greater is the lattice enthalpy. Therefore, as ionic size increases, lattice energy decreases. Using the sample above, the enthalpy of MgO is also much bigger than NaCl one because Mg atom is smaller than Na and O atom is smaller than Cl. Lattice energy therefore decreases down a group on the periodic table. Below there is a very useful picture of the periodic table and the trends of all the main important forces and atoms characteristics. Notice that the lattice energy increase in the period and decrease in the group on the periodic table. How to calculate enthalpy energies. The enthalpy change accompanying a chemical change is independent of the route by which the chemical change occurs. The standard atomisation enthalpy is the enthalpy change when 1 mole of gaseous atoms is formed from the element in its standard state. Enthalpy change of atomisation is always positive. To calculate the enthalpies we need to follow The Born-Haber cycle. It represents a series of steps leading to the formation of an ionic compound from its constituent gaseous ions.The Born-Haber cycle deals with ionic compounds only where metals tend to form cations, and non-metals form anions. 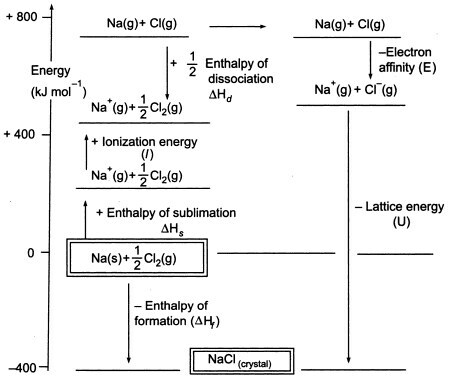 Let's keep using NaCl as our example to explain how the Born-Haber cycle works. As we have to produce gaseous atoms so that we can use the next stage in the cycle, the first step in the cycle involves the formation of gaseous sodium metal from solid sodium metal. In this endothermic step, the sublimation energy of sodium is +108 KJ. The second step,is also endothermic, and it is the formation of a chlorine atom from a diatomic chlorine molecule as we have to produce gaseous atoms so that we can use the next stage in the cycle. The bond dissociation energy of diatomic chlorine molecule is +122 KJ. The third step is the ionization of gaseous sodium atom to form a sodium ion. As you can expect, the energy change in the process is referred to as the ionization energy of sodium.This step is endothermic, with the ionization energy of sodium being +496 KJ. The ionisation energies go from gaseous atoms to gaseous singly charged positive ions. The fourth step is the addition of an electron to a gaseous chlorine atom, which is defined as the electron affinity of chlorine. This step is exothermic, -349 KJ. So, from the third and the fourth steps we get sodium and chloride ions. The electron affinities go from gaseous atoms to gaseous singly charged negative ions. Now, the final step is to form sodium chloride crystal from sodium and chloride ions. The positive and negative gaseous ions that we can convert into the solid sodium chloride using the lattice formation enthalpy. This is the lattice energy (U), the value of which will be provided to you to calculate lattice enthalpy or H. Here, U of NaCl is -788 KJ. Let's calculate now the lattice enthalpy.